Visit Eurol at Automechanika Dubai | Eurol B.V.
Eurol will exhibit again on the Automechanika Dubai trade fair from 7th till the 9th of May 2017. As the only independent lube oil blender from the Netherlands, Eurol Lubricants will show her complete range of premium quality lubricants. Eurol is celebrating 40 years of quality. 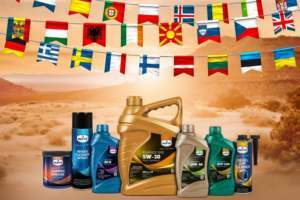 From the start, back in 1977, til now, we have grown to become a major international oil brand, now available in 75 countries. We manufacture and successfully offer a various range of lubricating oils, coolants, cleaning products and aftermarket additives. It is our pleasure to invite you to this trade fair. We look forward to welcoming you at stand SA-H24. Please register to set up a meeting with our sales representatives, who will be most willing to inform you about our company in the Netherlands and its products and services. Use the link below to enter the main website of Automechanika, then please click on the button on top of the right column to register.